Read more about Chronic Wasting Disease on the Rise in Wisconsin Deer; Will it Infect Humans? The global increase in grain prices may make the meat supply less safe. The European Union is considering a relaxation of feed bans that prohibit animal by-products being used as feed for other animals in the human food chain. The U.S. Department of Agriculture has been criticized for not totally banning "downer" cows -- animals "too sick or hurt to stand for slaughter" -- from the food supply. So "when a coalition of major industry groups reversed their position and joined animal advocates and several lawmakers in calling for an absolute ban," why wouldn't the USDA agree? The Associated Press notes that the Bush administration "will fight to keep meatpackers from testing all their animals for mad cow disease. The Agriculture Department tests fewer than 1 percent of slaughtered cows for the disease, which can be fatal to humans who eat tainted beef. A beef producer in the western state of Kansas, Creekstone Farms Premium Beef, wants to test all of its cows," but the US government has said such private testing is illegal. "U.S. 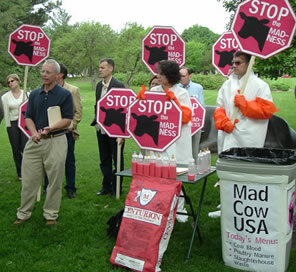 While scant serious attention is paid to mad cow disease by the U.S. Department of Agriculture, the U.S.